MsgFiler helps you declutter your inbox and tame the email dragon. Here’s how it works. When you purchase MsgFiler from the Mac App Store, it will be placed in your Applications folder. Opening MsgFiler for the first-time will display the welcome window. Add MsgFiler to your Login Items in Systems Preferences / Users and Accounts to ensure that MsgFiler is running when you open and use Mail. Mail must be running in order to operate MsgFiler. If you have not yet started Mail, do so now. When MsgFiler detects Mail is running, it will retrieve the list of mailboxes from Mail. When you first launch MsgFiler, macOS will display an alert asking allow MsgFiler.app to control Mail.app. Click the Lock icon. Enter your admin password. Select a message you wish to file in Apple Mail. Invoke MsgFiler by pressing the default keyboard shortcut, command-9 or the custom one you set up in Preferences. Type a few characters of the mailbox into which you wish to file the message. When the mailbox you desire is selected in the mailbox results list, press Enter or Return. If there are multiple matches, use the down arrow to select the correct mailbox before hitting Enter or Return. Note: If you file frequently to remote IMAP mailboxes, you may notice a delay between the time you press Enter and the time at which the message is actually filed by Mail. You can speed up filing to remote IMAP mailboxes by installing the MsgFiler Engine Mail Plugin and activating it from MsgFiler’s Filing Preferences panel. Master the use of the space character to quickly drill down to find the correct mailbox. Pressing (0-9) will select the numbered mailbox. Pressing Fn-(0-9) will file messages into the numbered mailbox. While in the mailbox results list, you can use the number keys, 0-9, to quickly select between the first ten mailboxes. Pressing a number key while holding down the Fn key or command-option-control will instantly file your message into the desired mailbox. Assign numbers to your favorite mailboxes for even faster filing. Previous versions of MsgFiler closed the window after filing a message. For version 3.1.2, Apple’s App Store Review Board made us change MsgFiler so that the MsgFiler window stays open after filing. For optimal performance, we recommend unchecking this preference. This will cause MsgFiler to hide itself after filing. Click on the action menu to display a list of configurable options for MsgFiler. Choose Keep MsgFiler open after filing. As you file messages using MsgFiler, recently used mailboxes will rise up to the top of your results window, granting you quick access to these mailboxes during subsequent filing operations. Recent mailboxes are denoted in a blue font color. If you haven’t filed to a recent mailbox after a period of time, the mailbox will move away from the top of the results list. If you find yourself filing often to a mailbox, consider making it a favorite mailbox. Marking a mailbox as a favorite will move the mailbox to the top of the results list. Favorite mailboxes are denoted by a bold font. To mark a mailbox as a favorite, select it in the results list and press command-equal or choose Add To Favorites from the MsgFiler Action menu. To remove a mailbox from favorites, select the mailbox and choose Remove From Favorites or press command-minus. You can use MsgFiler to navigate within the frontmost Mail message viewer. Hold down the command key and use the arrow keys to move the current selection up or down and to open and close threads. Select multiple messages at once by holding down the shift key while using the arrow keys. NOTE: This feature is only available on MsgFiler 3 on Snow Leopard. It has been disabled due to OS X Lion, Mountain Lion, and Maverick’s App Sandbox restrictions. The action menu is located next to the search field in the MsgFiler window. It provides quick access to commonly used settings and reveals additional filing options. Moves the selected messages in Mail to the currently selected mailbox. Copies the selected messages in Mail to the currently selected mailbox. Assign or remove a color label from the selected messages in Mail. Sets the frontmost message viewer to display the contents of the selected mailbox. Opens a new Mail message viewer focused on the selected mailbox. Instructs MsgFiler to reload the list of Mail mailboxes it is searching on. Adds the selected mailbox to the favorites list. Removes the selected mailbox from the favorites list. Clears the list of recent mailboxes. Adjust additional MsgFiler settings and options. Displays the welcome about screen for MsgFiler. Opens a new browser window or tab to the MsgFiler web site. With MsgFiler, you can quickly create new mailboxes, either underneath an existing mailbox or at the top-level of a mail account. Choose New Mailbox or New Top-Level Mailbox from the MsgFiler action menu or press command-shift-N or command-option-control-n respectively to bring up the new mailbox sheet. Enter the name of the new mailbox and click OK. MsgFiler will update the search field and results list to focus on the newly created mailbox. If you chose to create a new top-level mailbox, the sheet will have an additional popup menu from which you can select the mail account for the new mailbox. Note: This documentation is for MsgFiler 3.0.1. If you are running a previous version of MsgFiler, please upgrade to the latest version on the Mac App Store. Since MsgFiler is an application, it appears in your Dock when running. Check this box if you wish to hide the MsgFiler icon from the Dock. You may need to restart MsgFiler in order for your changes to take effect. The MsgFiler menu appears in Apple Mail to show you that it is running. Check this preference if you want to hide the MsgFiler menu in Mail. Adjust the font used by MsgFiler in the mailboxes results list. This alternates focus on the Mail application and the MsgFiler window. This will open and close the MsgFiler window. This will always open MsgFiler window. Depending on your workflow, you may prefer one of these settings over the others. By default, this preference is set to toggle MsgFiler on and off. The default shortcut is command-9 and only works while in Mail. If you change it, be sure to choose a keyboard combination that does not interfere with the operation of Mail. To change the shortcut, click the field next to the label MsgFiler Shortcut. A prompt will appear in the label to choose a new shortcut. Type your new command. The change will be immediate. This section configures how MsgFiler searches for mailboxes in Mail. This option allows you to file messages only to mailboxes contained in the currently selected account. For instance, suppose you have two mail accounts, all of which have a mailbox called Archive. When filing a message in one of the accounts, typing “Archive” will show matches for both mailboxes in all both mail accounts. Enabling this preference ensures that only the mailbox named “Archive” of the currently selected mailbox account will be visible in the search results list. By default, MsgFiler searches the entire mailbox path for matches. Check this box if you want to restrict MsgFiler to search on only the mailbox name itself. You can also access this setting from the action menu of the MsgFiler window. By default, MsgFiler performs a case-insensitive search when matching mailboxes. Two mailboxes named “archive” and “Archive” are considered identical for search purposes. Enable this preference if you wish to make MsgFiler perform a case-sensitive search. You can exclude certain mailboxes and accounts from appearing in the mailboxes results list. Clicking on the button Manage Excluded Mailboxes… will bring up a sheet where you can add or remove excluded words. Any mailbox or account that include these words will be hidden from the results list. Enabling this option prevents MsgFiler from closing after performing a filing operation. This is useful when you want to file dozens or hundreds of messages at a time. 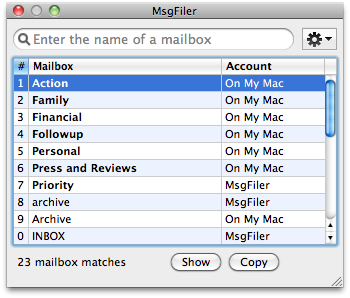 Having the MsgFiler window stay open after filing allows you to quickly type the next mailbox and hit Return to file. MsgFiler Engine is an Apple Mail plugin that you can install to make filing to remote IMAP mailboxes faster. It is strongly recommended for use with MsgFiler 3 on Lion, Mountain Lion, and Mavericks. Learn more about the MsgFiler Engine here. Pressing the Enter or Return key or double-clicking in the mailboxes results list will perform the default filing action. By default, this is Move Message, but you can change it to Copy Message, Show Mailbox or do nothing. Moves the selected messages in Mail to the selected mailbox. Copies the selected messages in Mail to the selected mailbox. Opens the frontmost message viewer in Mail to the selected mailbox. You must click the buttons Move, Copy or Show to file your messages. Sets Show mailbox as the default action. Sets Copy mailbox as the default action. Sets Move mailbox as the default action. MsgFiler will file to the currently selected mailbox. MsgFiler will move focus from the search field to the mailbox results list. Note: If only one item is visible in the mailbox results list, pressing Enter/Return will always perform the default filing action. Moves the cursor up one message in the frontmost Mail message viewer. Moves the cursor down one message in the frontmost Mail message viewer. Note: When Mail reaches the end of the list of messages, it loses focus in the frontmost message viewer. Note: When MsgFiler Engine is used to file messages, this preference is disabled. By default, MsgFiler will remember and display recently accessed mailboxes at the top of the mailboxes results list. Uncheck this box if you do not want MsgFiler to keep track of recently used mailboxes. Show off to your friends with the number of messages you’ve filed with MsgFiler. This is a great way to see how much time you’ve saved over dragging and dropping. When MsgFiler is first installed, a welcome message is displayed to the user. Check this box if you want the message to appear every time you launch MsgFiler. Pressing escape at any time will close MsgFiler. Pressing escape a second time will close MsgFiler.